A new organ based mainly on the organs of Richard Bridge (ca1735-1756). 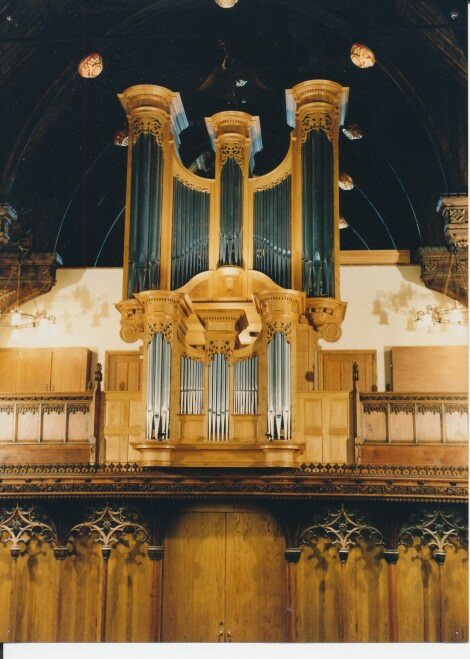 Some of the Chair organ is based on the Thomas Dallam organs of ca1680 at Lanvellec and Guimiliau in Britanny. The Cromhorn and Vox Humana are based on the ca1695 reeds at Adlington Hall in Cheshire, the resonators on the reeds at Guilimiau with some adaptations. The Trombone uses the William Hill resonators of about 1871, with shallots blocks and boots based on the 1855 Hill at Kidderminster Town Hall. The double case is made of oiled and waxed oak, standing 6m high from the gallery floor, decorated with classical mouldings and carving. It is based partly on the organ formerly in Chester Cathedral and now in St Paul’s Valetta, Malta. Pitch is a¹=440Hz. The tuning system is Young’s temperament. The wind pressure is 63mm to the manuals and 80mm to the pedals. The Revd. John Hancock was Vicar and Donald Wright was advisor.